The breakdown of a marriage or relationship is a stressful and emotionally-charged time. It is made all the more difficult when there are children involved and this requires a high level of sensitivity, discretion and specialist knowledge. Each month the Wellers family law teams in Bromley and central London, Wellers Reece-Jones in Sevenoaks and Wellers Hedleys in Bookham are offering a free half hour consultation to the first six callers to each of our offices. It’s a great opportunity to get your questions answered and better understand your options regarding divorce, financial matters and access to children. Unfortunately we are not able to advise you if you will be seeking legal aid as we do not offer that service and we do not offer advice regarding children where the local authority/children services are involved. Please call on 020 8290 3985 for the Bromley team, 01732 446374 for Sevenoaks, 01372 750117 to talk to a family lawyer in Surrey and 020 7481 6393 for central London.We also have an Out of Hours number – 07931 121129. It is essential that any children’s feelings are put first and they are not caught in the middle of parental conflict. Parents should always endeavour to come to an agreement regarding the care arrangements for any children between themselves first. However, this is not always possible as such important decisions can be difficult to make, especially in the midst of an acrimonious divorce or relationship breakdown. 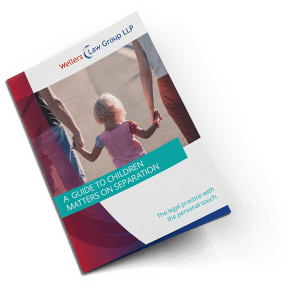 At Wellers Law Group LLP, we advise our clients on the options available to them as parents and help clients to resolve any contested issues raised in relation to children. If you are having issues agreeing on the care and living arrangements for your child or children (formerly known as custody), the frequency of parental contact (formerly known as access), agreements regarding the children’s schooling or the possibility of a child being removed from the jurisdiction, we strongly suggest that you seek preliminary legal advice. Our family team specialises in difficult and intractable cases concerning children issues arising on divorce or separation such as Specific Issue Orders, Prohibited Step Orders, Parental Responsibility Orders, internal and external relocation applications and Child Arrangement Orders (formerly known as Residence and Contact orders). The courts recognise that it is important for children to not only see their parents but also members of their wider family. For this reason we have experience is assisting grandparents and step-parents who seek our advice and guidance in maintaining or increasing their level of contact with children involved. Child arrangements order – an order regulating the arrangements relating to with whom a child is to live with and what time they will spend with other parent/person. Parental responsibility – Where the parents are married to each other at the time of the child’s birth both acquire ‘parental responsibility’. This sets out the rights, duties, obligations and responsibilities that both parents have under the law. Unmarried mothers automatically have parental responsibility whereas unmarried fathers may, depending on their individual circumstances, need to acquire Parental Responsibility by a court order or a formal written agreement with the mother. Since December 2003, an unmarried father (providing he is registered as the father of the child on the birth certificate) will now automatically acquire Parental Responsibility. Specific issues – In certain circumstances it may be necessary for orders to be made dealing with certain aspects of a child’s upbringing; schooling, medical treatment, or issues relating to the child’s religious upbringing. Financial provision – Where unmarried parents cannot reach agreement the court may make financial orders to provide for maintenance, lump sum(s) and the settlement and/or transfer of property. Leave to remove –it may be necessary to seek an order for permission to permanently remove your children to live outside England and Wales. We will help you to put together a properly thought out relocation plan to help you achieve your objectives. Abduction – We can assist in cases where children have been wrongfully retained in other countries and/or abducted from the care of the parent with whom they live. It is vital that if you are concerned that your child may be abducted take legal advice as quickly as possible to put in place the appropriate safeguards. If you would like more information on aspects of family law including the divorce process, property and financial settlements on divorce, and the law as it relates to unmarried, cohabiting partners then please download our free family law guides. To speak to family law solicitor, please call us on 020 8290 7992 for our Bromley team, 01732 446374 for Sevenoaks, 020 7481 6393 for central London or 01483 284567 for our Surrey team. Alternatively, email your enquiry to familylaw@wellerslawgroup.com. We offer a fixed fee, no obligation one hour interview so that we may provide you with initial advice and suggest the options for your next course of action.